← A Great End to 30, A Great Start To 31! Thanks everybody for all the birthday wishes! I started the day by crossing paths with a coyote at dawn, then climbed a classic mountain with my Dad, my sister and my friend Devin, and ended at home in Pennsylvania with a huge, well-earned slice of my Mom’s chocolate cake. It was a perfect day! 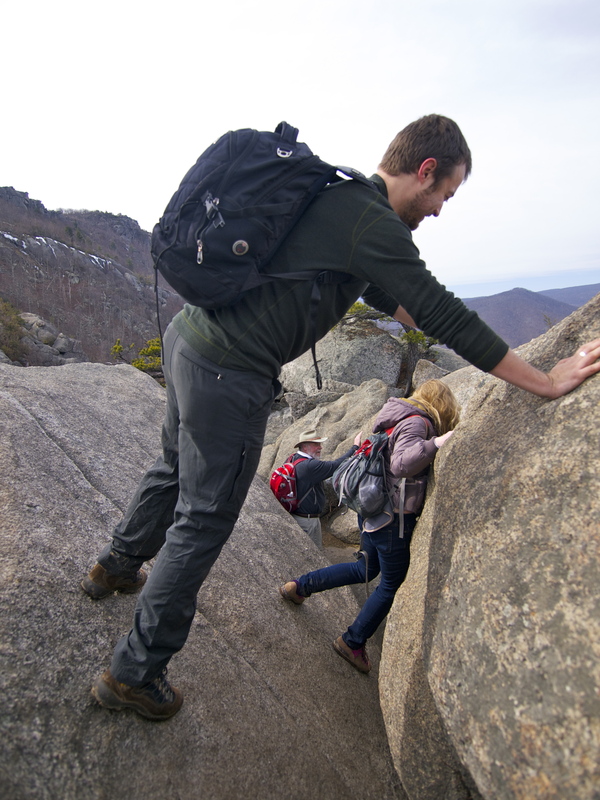 I’ve been wanting to climb Old Rag Mountain in Shenandoah National Park for ages, after hearing so many wild stories about the epic boulder scramble to the top. 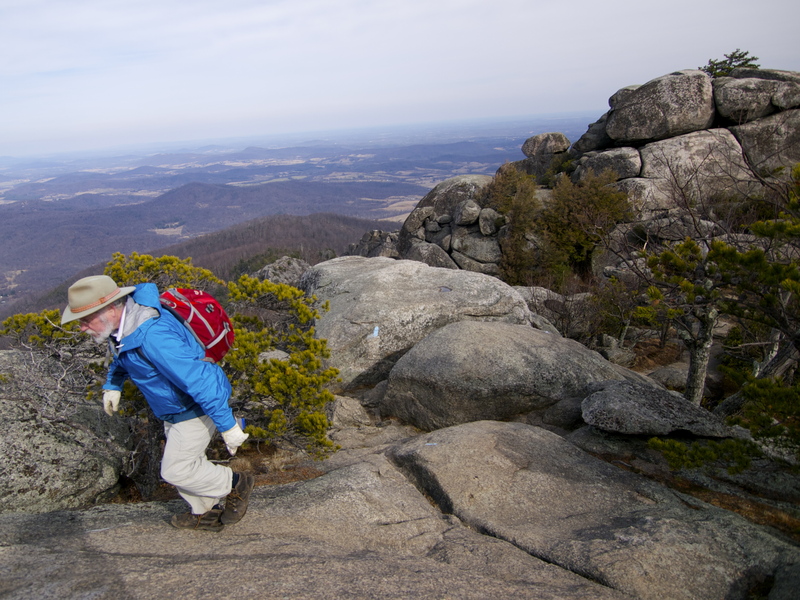 But Old Rag is one of a handful of hikes in Shenandoah that doesn’t allow dogs, so I always went elsewhere in the park. Plus, the trail is notorious for crowds. A few weeks ago, driving up to PA for my sister’s annual solo show, I took the scenic route on Skyline Drive through Shenandoah and caught a glimpse of Old Rag’s ragged summit and decided this was the year to make it happen! Overlooking Skyline Drive from Old Rag. The scenic road through Shenandoah National Park runs along the ridge in the background. 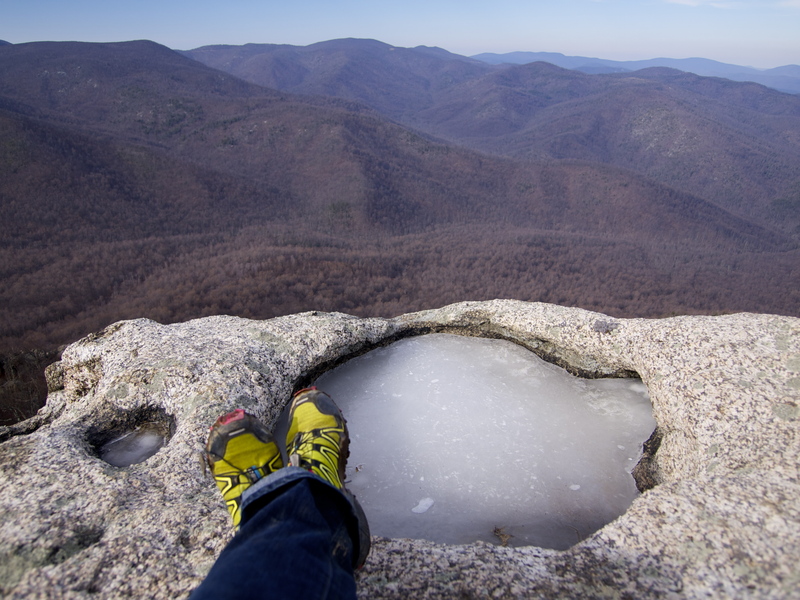 Old Rag is one of the east coast’s most classic climbs: a 9-mile loop up 2,500 feet of elevation, the last mile a hectic scramble over van-sized, precariously balanced boulders. The ragged-looking mountain isn’t all that high – at 3,291 feet it doesn’t even make Shenandoah’s top ten highest points – but its unique bald bouldered summit stands out among the region’s mostly forested peaks. 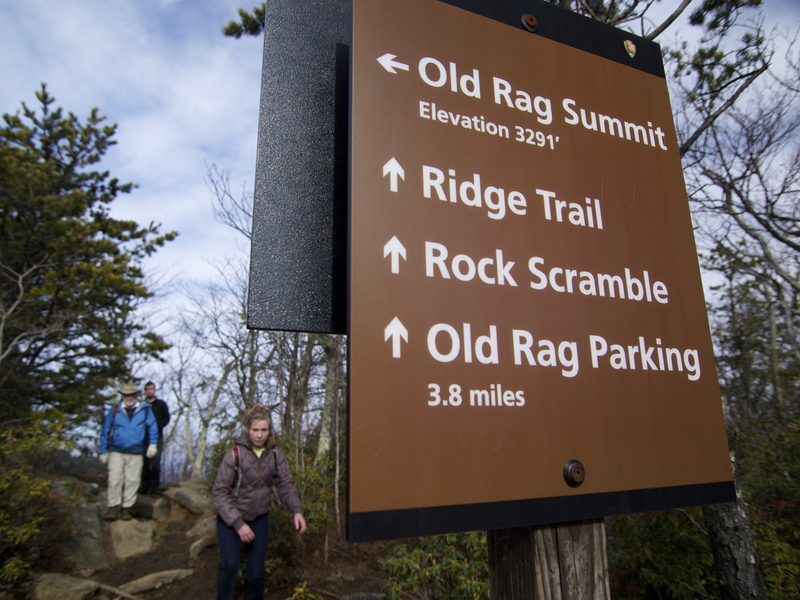 Old Rag is a geology-lovers paradise: the “Old Rag Granite” was formed over a billion years ago and once formed a vast mountain range, longer and higher than the Rockies. 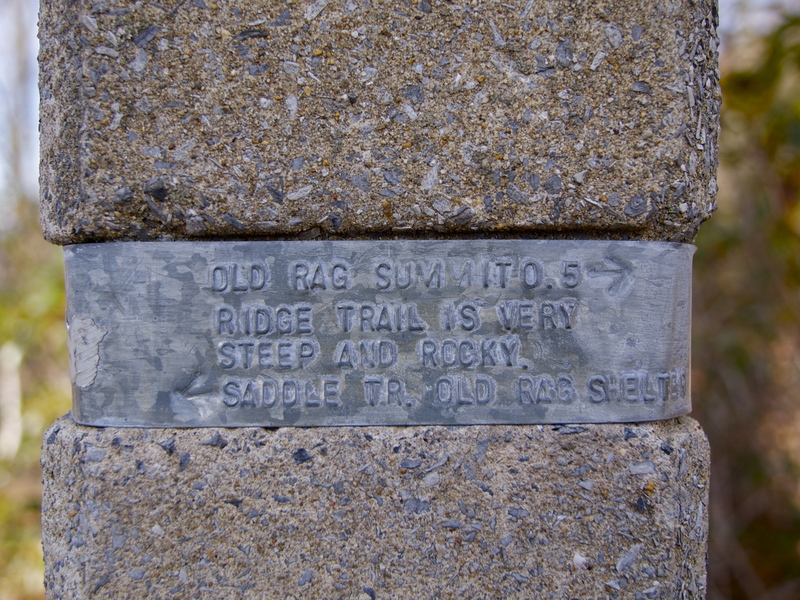 Today, all that remains in this area of Virginia is Old Rag Mountain. 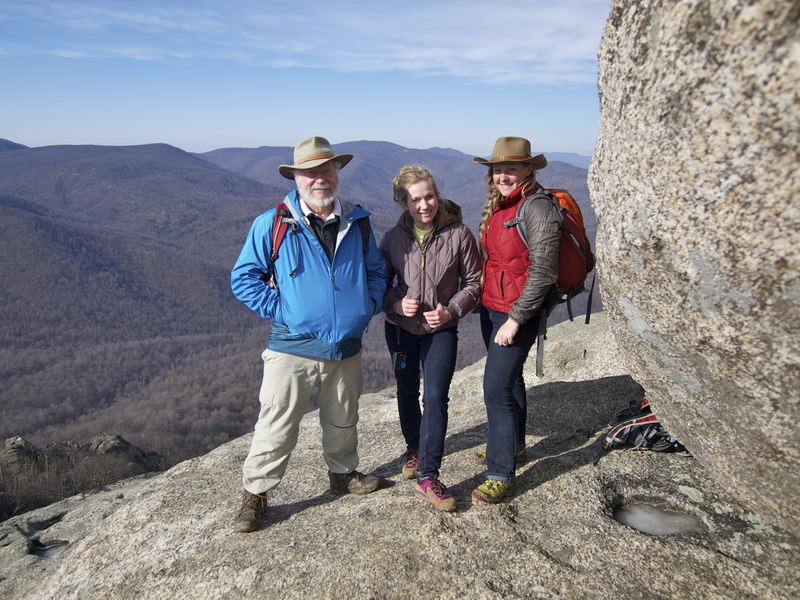 Old Rag looks different than the surrounding peaks because it is different: a monadnock of granite surrounded by a sea of quartzite mountains, ancient lava flows and limestone valleys. In my 31 years, I’ve hiked a lot of trails, but the Ridge Trail up Old Rag might be one of the more creative paths I’ve ever seen blazed through a landscape. 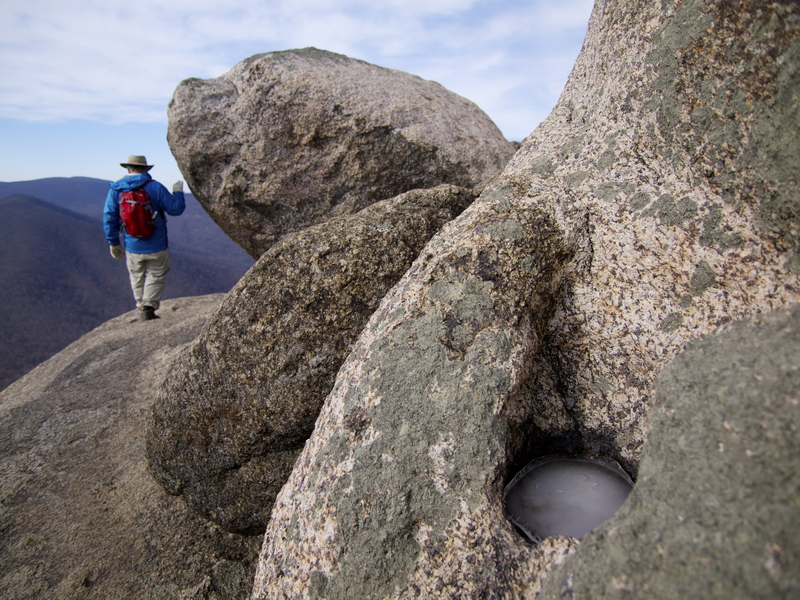 Arrows point the way up boulders, down narrow passages and across crevasses. We had a few graceless scrambles, tight squeezes and leaps of faith, but all four of us made it to the summit with only a few abrasions from the sharp rocks. Here’s a tip: bring gloves and wear sleeves and long pants! 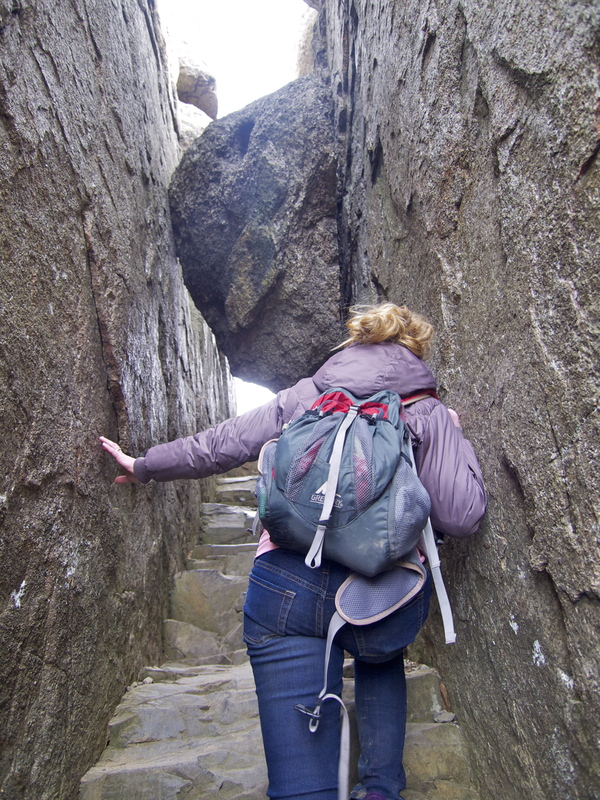 The crystals in the granite are huge and very sharp and getting to the top requires hands, knees and elbows in addition to your feet. 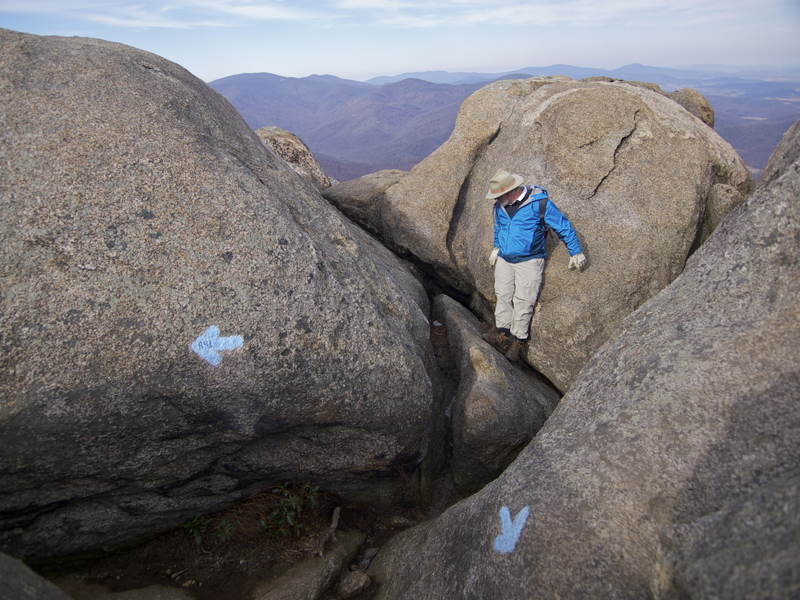 And so it begins… the gateway to the Ridge Trail up Old Rag: a mousetrap boulder on the Devil’s Staircase! A 12-foot drop down between boulders. My Dad negotiating one of the many tricky boulder problems on the way up Old Rag. He’s smart to wear gloves– the hard, rough granite tears up your hands! Devin and Sarah chimneying across a narrow boulder passage. Nearing the first false summit where we had lunch. The slightly higher true summit is another quarter mile up the trail. My dad next to the summit boulders on Old Rag. Notice the icy pothole in the foreground. These pits, called Opferkessels, are created by gradual dissolution of the rock by standing water. Self Portrait with a giant summit Opferkessel. A pit this size may take tens of millions years to form! Makes my 31-years seem young! Victory shot on the summit boulders, taken by my sister. Summit Family Photo by Devin. Sarah needs a hat! Before we started up the mountain, Devin asked if this hike was really up to snuff for one of my birthday hikes, which tend towards the epic. Sure, Old Rag isn’t the Grand Canyon and it’s about 6,000 feet lower than my highest birthday mountain, the Pedernal in New Mexico. But my annual birthday trek isn’t about numerical superlatives. It’s about spending the day doing what I love: traveling on my own two feet to some place rare and beautiful. Here’s to making the most of this day, this year, this life! 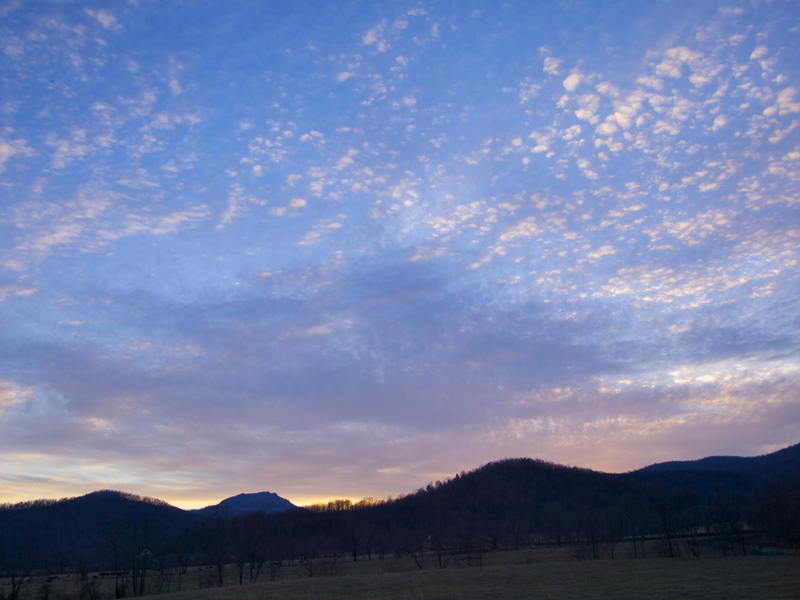 Departing Old Rag at sunset. The mountain is the second from the left. 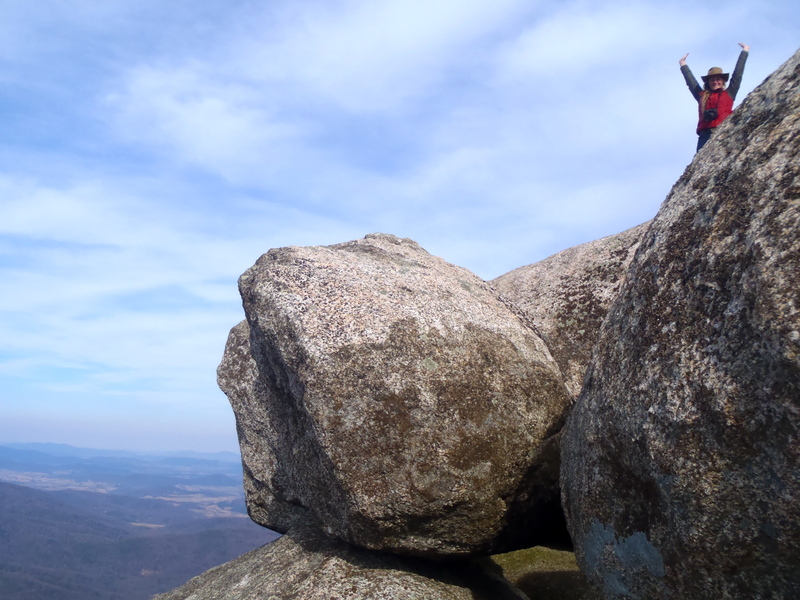 This entry was posted in Bowie & D.O.G., Hiking!, Photography, Road tripping!, Vagabonding 101 and tagged boulder scramble, Old Rag, Shenandoah. Bookmark the permalink. 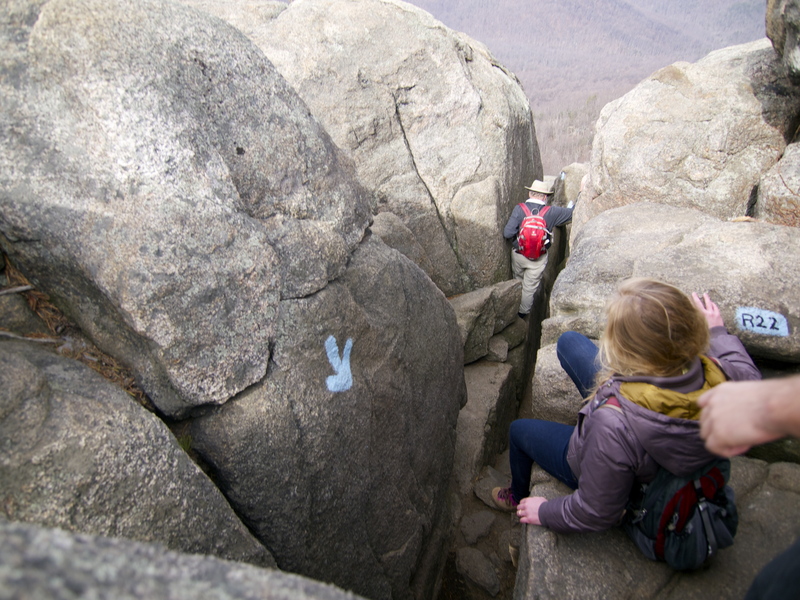 12 Responses to Happy Birthday Hike: Old Rag! WOW ! Mary what a fantastic adventure, and these pictures are so clear I feel that I am almost there its so breathtaking. Thanks for sharing your wonderful life. I really envy you. Happy Birthday & wishes to you for many…more! Those blue arrows on the boulders are a crack up. Thanks for sharing the photos. Looks like you had a fun time with your fam. P.S. I especially like your observation about being young in comparison to the opferkessel. Great line!